A special, limited edition hardback print run of ‘A Song For Will’ – The Lost Gardeners of Heligan is published this month. Hilary Robinson and Martin Impey worked closely with The Lost Gardens of Heligan in Cornwall to produce a deeply moving, highly illustrated story for children and young adults. It tells of the gardeners and outdoor staff who enlisted after the outbreak of World War 1 and focuses on the military service of stone mason, Fred Paynter, and gardener, William Guy. 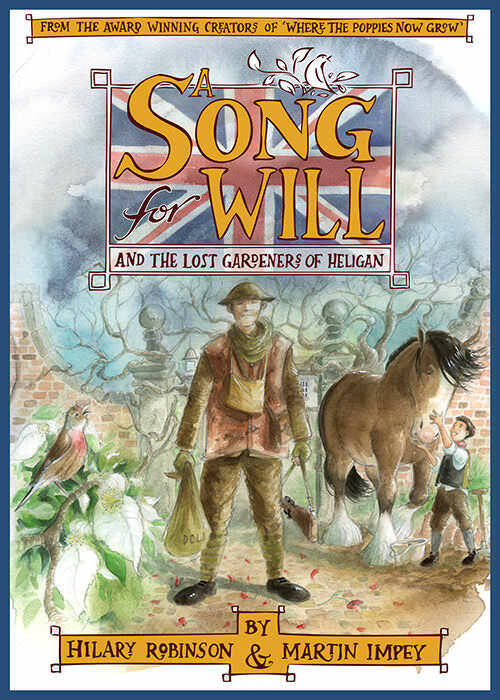 Today the gardens at Heligan are a major tourist attraction and memorial to their staff that didn’t return in 1918 and ‘A Song For Will’ brings that bygone age alive again for readers of today.